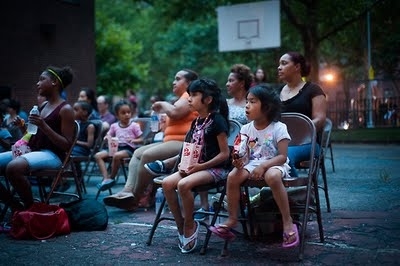 A large crowd attended the screening of the film Doin It In The Park, by Bobbito Garcia and Kevin Couliau. The movie documents the history and culture of street and pickup basketball in NYC. Bobbito and Corey “Homicide" Williams, a NYC street ball legend, attended the screening and stayed to answer questions and speak with residents. We wish to gratefully acknowledge the support of the Awesome Foundation - NYC which helped make this event possible. In addition the event was sponsored by Healthfirst, Claremont Neighborhood Center and Bronx Lebanon Hospital.